This spacious two-story Snowcreek V townhouse is absolutely beautiful and in amazing condition with 2 bedrooms, 2 full baths, a large living area, balconies with amazing views of the Eastern Sierra, granite counter tops throughout, and a 1-car garage, sleeping up to 7 guests. The master bedroom with private bathroom with a separate shower and bathtub has his and hers sinks as well as a king size bed and large private patio just through the sliding glass doors. The 2nd bedroom located on the second story has a twin over queen bunk bed and private balcony as well with a full bathroom located just down the hall. There is a washer and dryer in the condo, fully equipped kitchen with all of the essential appliances, cooking utensils, and some added extras, large family dining room with additional bar seating, and a pull out sofa bed in the living room that can accommodate two more. 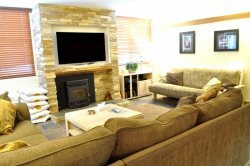 In the living room you’ll find a large comfy sectional couch that the whole family can enjoy while sitting around the gas fireplace, also for your convenience you’ll a TV, DVD player, and cable TV. There are also a few hot tubs onsite (one located directly across from this condo) that all boost amazing views of the surrounding Sierra’s.